The Great Lakes and St. Lawrence River have been major North American trade arteries since long before the US or Canada achieved nationhood. Today, this integrated navigation system serves miners, farmers, factory workers and commercial interests from the western prairies to the eastern seaboard. Opened to navigation in 1959, the St. Lawrence Seaway part of the system has moved more than 2.5 billion metric tonnes of cargo in 50 years, with an estimated value of more than $375 billion. Almost 25% of this cargo travels to and from overseas ports, especially Europe, South America, the Middle East, and Africa. From Great Lakes/Seaway ports, a multi-modal transportation network fans out across the continent. More than 40 provincial and interstate highways and nearly 30 rail lines link the 15 major ports of the system and 50 regional ports with consumers, products and industries all over North America. The Great Lakes/St. Lawrence Seaway was built as a binational partnership between the US and Canada, and continues to operate as such. The Saint Lawrence Seaway Development Corporation is a wholly owned government corporation created by statute on 13 May 1954, to construct, operate and maintain that part of the St. Lawrence Seaway between the Port of Montreal and Lake Erie, within the territorial limits of the USA. Trade development functions aim to enhance Great Lakes/St. Lawrence Seaway System use without respect to territorial or geographic limits. The mission of the corporation is to serve the US intermodal and international transportation system by improving the operation and maintenance of a safe, reliable, environmentally responsible deep-draught waterway, in co-operation with its Canadian counterpart. The SLSDC also encourages the development of trade through the Great Lakes Seaway System, which contributes to the comprehensive economic and environmental development of the entire Great Lakes region. The SLSDC headquarters staff offices are located in Washington, DC. Operations are located at the two US Seaway locks (Eisenhower and Snell) in Massena, NY. CANADIAN ST. LAWRENCE SEAWAY MANAGEMENT CORPORATION (SLSMC) The St. Lawrence Seaway Management Corporation is a not-for-profit corporation responsible for the safe and efficient movement of marine traffic through the Canadian Seaway facilities, which consists of 13 of the 15 locks between Montreal and Lake Erie. The Corporation plays a pivotal role in ensuring that the waterway remains a safe and well-managed system, which it shares with its American counterpart, the Saint Lawrence Seaway Development Corporation. The Corporation’s mandate promotes efficiency and responsiveness to the needs of shipping interests, ports, marine agencies, and provincial and state jurisdictions. The two Seaway entities co-ordinate operational activities particularly with respect to rules and regulations, overall day-today operations, traffic management, navigation aids, safety, environmental programmes, operating dates, and trade development programmes. The unique bi- national nature of the System requires 24-hour, year-round coordination between the two Seaway entities. US and Canadian agencies share responsibility for maintaining aids to navigation (from buoys, lights and channel markers to sophisticated electronic positioning systems used by large commercial vessels) throughout the Lakes. They also operate marine communication and vessel traffic systems that co-ordinate the movement of commercial vessels in the waterway. The two countries share the job of investigating commercial marine accidents, and maintain search-and-rescue capabilities covering all the Great Lakes. One of the best examples of this co-operative spirit is the joint foreign flag vessel inspection programme in Montreal that has dramatically streamlined St. Lawrence Seaway operations. The programme involves both US and Canadian Coast Guards, the US SLSDC and the Canadian SLSMC. Since 1998, safety and environmental vessel inspections of foreign vessels have been conducted jointly by the US and Canada to accomplish the port/state vessel inspections as well as ballast water tests. By consolidating all required inspections and tests, the amount of time required by vessel operators to transit the waterway is greatly reduced. Opened to deep draught navigation in 1959. Vessel maximum: 225.5m (740ft) length; 23.77m (78ft) beam; 8.08m (26ft, 6in.) draught; 35.5m (116.5ft) height above water. Channels maintained at 8.2m (27ft) minimum over the chart datum. Sailing time (normal conditions) between certain ports on the Great Lakes and the intersection of the Seaway ship channel and Montreal Harbor, using an average sailing time of 12mph (10.4 knots). Since 1959, more than 2.5 billion tonnes of cargo estimated at $375 billion have moved to and from Canada, the United States, and nearly 50 other nations. Includes some of North America’s largest ports, part of an excellent intermodal transportation network. Agricultural products: these represent about 40% of all Seaway trade. Grain shipped both by the United States and Canada is primarily for export. Cargoes include wheat, corn, soybeans, barley, oats, and flaxseed. Iron and steel products: raw and processed, these have been a major cargo for the Seaway since it opened. Products include steel slabs, scrap iron, bars, rods, and manufactured iron and steel. These commodities carry the highest value of goods shipped on the Seaway and their handling is the most labour- intensive. Mine products: these make up more than 40% of total Seaway trade each year. Products include iron ore, coal, coke, salt, and stone. There is strong demand by European utilities for low- sulphur coal from the Powder River Basin in Wyoming and Montana shipped via the St. Lawrence Seaway. Other processed and manufactured products: in addition to iron and steel products, the Seaway is a cost-competitive route for a number of other processed cargoes. Each year more than 10% of Seaway trade consists of fuel oil, petroleum products, chemicals, forest products, and animal products. Operators looking for a great place to load or unload their bulk cargoes near the largest population base in Quebec would do well to try Logistec Stevedoring. Logistec has two terminals located at close proximity to each other that can service the Montreal area with highway access to the road network for local destinations and can also provide access to markets that are further away, which can be reached with excellent rail connections available at both facilities. Of course, we’re talking about Logistec’s premier bulk facilities: the Laurier Terminal is located at the Port of Montreal, and the Contrecoeur Terminal, approximately 45 kilometres downriver. Both terminals are located on one of the largest navigable waterways in the world — the St. Lawrence River — and offer the shortest route between major European ports and North American markets. Situated 1,600 kilometres inland from the Atlantic Ocean, both are international ports closest to North America’s industrial heartland, serving a hinterland of some 100 million Canadian and American consumers, representing the shortest transit time between Europe and the US Mid-West — open 365 days per year. Because of the close proximity of both terminals, and depending on the nature of the product being handled, there is virtually no waiting time if the customer is the least bit flexible. If one place is busy, then the vessel can be served at the other terminal, easy as that. The customers must just remember to charter their vessels accordingly by including both names in the charter party. Both facilities offer a high level of expertise in handling bulk cargoes with highly specialized equipment and machinery onsite, as well as an experienced labour force, supervisors, and managers. At the Contrecoeur Terminal, cargoes are handled with gantry cranes, whereas at the Laurier Terminal, state-of-the- art mobile harbour cranes are used. Products handled include iron ore, concentrates, fertilizers, coal, gypsum, sugar, alloys, and a variety of other bulk cargoes. In addition to these two facilities, in October 2009, Logistec acquired Les Terminaux Rideau Bulk Terminals Inc. (RBT). With its network of four port terminals in the Seaway system, and two inland terminals, RBT allows Logistec to offer its customers a wider geographic coverage as well as many value-added services. Logistec Stevedoring Inc. is a division of Logistec Corporation, a publically traded company on the Toronto Stock Exchange. Logistec provides over six decades of experience in cargo-handling services through a strong network of strategically located facilities in the Great Lakes, in the St. Lawrence River, on the eastern seaboard of North America, and in the US Gulf. Fednav’s FALLine division is celebrating 55 years of consecutive direct maritime liner service from Europe to the St. Lawrence and Great Lakes’ ports. It was with the opening of the Seaway in 1959 that Fednav first transported parcels of steel westbound to the heartland of North America under the name Federal Atlantic Lakes Line (FALLine). Initially an exercise of repositioning ships to load outbound grains at the head of the Lakes, FALLine developed into a competitive maritime service — combining steel beams, coils, plates, slabs, rods, etc., with bulk parcels and dimensional general cargo of various types including industrial and agricultural machinery (presses, transformers, generators, combines, large dryers), locomotives and railcars as well as yachts, windmill equipment, and tanks. Today, FALLine offers over 40 sailings each year, mainly from Antwerp, Bremen or Brake (other load ports upon inducement) to Sorel, Hamilton, Cleveland, Detroit, Milwaukee, Burns Harbor, and other ports. During the winter the port of Sorel is called on a monthly basis. Going forward, ISO/ISPS-certified FALLine will continue to offer its customers reliability and flexibility in scheduling, employing a modern fleet of Seaway maximum-size vessels, including six new box-hold Lakers to deliver in 2015 and a further six new Lakers in 2016, while remaining committed to reducing its environmental footprint. Fednav is an international ship-owning company headquartered in Montreal. Its principal activities include the transport of bulk and general cargo worldwide. The company has offices in Antwerp, Barbados, Hamburg, Rio de Janeiro, London, Singapore, and Tokyo, as well as regional offices in Canada and the United States. Fednav also has terminal, logistics, ice analysis, and shipping agency services and divisions. It employs 260 people and nearly 2,000 crew members and stevedores. Fednav continues to play an important role in the St.Lawrence-Great-Lakes, transporting mainly grain and industrial minerals outbound and alumina, sugar, and fertilizers as well as steel and general cargo on its regular breakbulk service from Europe inbound. Fednav currently has 20 ships on order, 12 of which are Seaway suitable, a clear demonstration of the company’s confidence in the future of the Seaway and of its commitment to its shippers. Cavotec has won three orders worth a total of more than EUR 28 million for MoorMasterTM automated mooring systems at applications in Australia, Canada and Denmark, one of which — for the St. Lawrence Seaway in Canada — is the largest to date for MoorMasterTM, and one of the biggest projects in the history of the group. “These projects further illustrate the growing acceptance of MoorMasterTM and its adaptability to a variety of locations and applications,” says Ottonel Popesco, Cavotec CEO. “The project with the St. Lawrence Seaway represents a major milestone for the Group and for MoorMasterTM. It is also the latest stage in our long-running cooperation with the Seaway,” Popesco adds. Under the terms of the agreement with the St. Lawrence Seaway, Cavotec will manufacture and deliver 39 MoorMasterTM MM400L (Lock) units for 13 locks, and related rail structures on which the units will be mounted. Cavotec engineers will also oversee delivery, installation and commissioning of the units. Deliveries are scheduled to run until the end of 2016. Several MoorMasterTM units have been in operation at the Seaway for a number of years. These specially adapted units hold vessels securely through variations in water level of up to 14m. The St. Lawrence is the world's first inland waterway to introduce automated mooring. “With the implementation of Cavotec's equipment, we are looking forward to welcoming more Seaway-sized vessels from the world's fleet, as vessel operators will no longer need to equip their ships with certain Seaway specific fittings. This will increase our access to the global fleet. Easing access to the Seaway carries the prospect of bringing more tonnage into our locks,” says Bruce Hodgson, director of market development for the St. Lawrence Seaway Management Corporation. Considered to be one of the greatest engineering feats of the 20th century, the 3,700km-long Seaway is made up of 15 locks, two in the US and 13 in Canada. It forms an essential trade link between the Atlantic Ocean and the Great Lakes at the heart of North America. In Denmark, Cavotec has been awarded an order for two MoorMasterTM MM400 units that will be used in conjunction with a new-build LNG passenger (and vehicle) ferry on a frequent service between Hov, in Jutland, and Saelvig, located on the west coast of the island of Samsoe. The order includes installation and commissioning. The units will securely hold the vessel in place during mooring operations in wind speeds of more than 20m/s, and automatically adjust the position of the vessel according to tidal variations. The units will also enable more streamlined, efficient operations, and improve safety for those on board the vessel and those onshore. Cavotec won this order despite competition from rival systems, none of which deliver the operational and safety benefits made possible by MoorMasterTM. Cavotec will also work with the customer. In the third project, Cavotec has been contracted to support the installation and commissioning of eight MoorMasterTM MM200B (Bulk) units by dredging company Jan de Nul at a bulk handling application in Australia. MoorMasterTM is currently in operation at bulk and container handling, Ro/Ro, ferry and lock applications in North America, Europe and Australasia. In November last year, Cavotec also announced its first MoorMasterTM order in Africa. MoorMasterTM is a vacuum-based automated mooring technology that eliminates the need for conventional mooring lines. Remote controlled vacuum pads recessed in, or mounted on the quayside or pontoons, moor and release vessels in seconds. Within the Great Lakes basin, on both sides of the Canada–US border, ready access to a marine transportation option complementing robust road and rail networks helps power the region’s $4 trillion economic engine. Yet traffic levels on the Great Lakes–St. Lawrence Seaway are low by historical standards. The system’s volume is estimated to be down by as much as 50% from its late-1970s peak. There are fewer vessels, making fewer trips, and there is also a fair amount of unfilled vessel space currently moving on the system, in the form of partial loads or backhaul capacity. The Port of Hamilton, Ontario, located at the far western end of Lake Ontario, is the largest Canadian port on the Great Lakes, handling a mix of dry and liquid bulk, breakbulk and project cargo. The Port Authority sees opportunity in the Seaway’s underused capacity, and set out to tackle the system’s barriers with new technology. HPA has launched its new Marine Gateway online cargo and capacity matching service that provides a simplified way to move bulk, breakbulk and project cargo by connecting shippers with available vessel capacity. “We’re responding directly to customer demand, by making marine shipping easier and more flexible,” said Hamilton. Cargo owners, shipping lines, and other marine service suppliers can join up using the Marine Gateway link on the Port of Hamilton’s website. The service is free and takes just a few seconds to sign up. When shipping lines have room aboard vessels travelling to or from the Great Lakes and global destinations, they can post their capacity, notifying cargo owners of availability. Cargo owners can in turn post cargo they need shipped, and request confidential quotes from a list of prequalified suppliers. It’s a one-stop-shop that also connects shippers with quotes for insurance, storage and stevedoring. Since the web portal’s launch in late 2013, more than 60 shippers, shipping lines and other marine service providers have signed up to use the service. “Great Lakes shipping season is just kicking off, and we’re already seeing new users, and new cargo on the Seaway,” said Hamilton. HPA is inviting shippers, shipping lines, freight forwarders, third-party logistics suppliers, and other suppliers to sign up to begin receiving capacity notifications and cargo quote requests. What was once the ‘quiet’ time of winter in the Great Lakes region is now a beehive of activity as the grain terminals get ready for the opening of navigation and the start of what some predict will be a busy year for grain shippers. 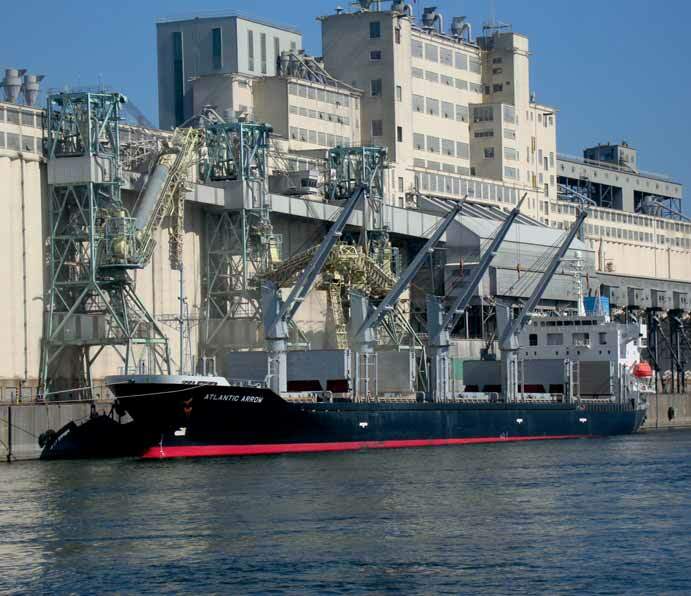 Grain trading company Parrish & Heimbecker Limited — 105 years old —	is one that continues to upgrade its Great Lakes capacity. P&H’s terminal in Hamilton, Ontario is getting an environmental facelift as the company invests in state-of-the- art dust control systems for shiploading. P&H’s success in shipping corn, soybeans, and wheat from this Lake Ontario port has prompted it to invest in cleaning and aspiration equipment as well, as it strives to meet rigid quality standards around the world. P&H’s focus on quality control is engrained in its day-to-day business. Being Canada’s second-largest flour miller, P&H manages the supply chain to its internal demand as well as domestic and export markets around the globe, but its focus on understanding customer requirements and managing quality is evident in its meticulous preparation. When asked about the design of the Hamilton facility and the unique dome structures and low profile belt systems, P&H regional manager Matt Gardner responded,“the design and equipment capability are very helpful in maintaining product integrity and quality. Loading corn out of the Great Lakes without cracking is a challenge, but our investment here is really paying off in that regard”. In 2013 P&H completed a joint venture with Cargill Limited in the Port of Thunder Bay to feed downstream domestic markets and the expanded export market, thanks to the removal of the Canadian Wheat Board monopoly on wheat and durum exports. P&H moves domestic wheat, durum, and canola from its line of prairie grain elevators to Thunder Bay, then through key bay ports in Goderich and Port Colborne Ontario, or on to export positions in the St Lawrence. “Our deck of system and private rail cars, our laker vessel capacity and our ocean freight commitments all work together to allow us some flexibility and security in our execution” stated Darryl Markle, a P&H trader. P&H views keeping supply chains secure and low cost as the secrets to its success. To that end, it supports marine shipping business with a group of five rail terminals in Ontario that feed grain to the St. Lawrence ports and to the markets in the US interior, and five marine terminals in the Great Lakes which facilitate both downstream movement of western Canadian grain and serve as export hubs to ship Canadian grain to the world markets. A new commodity is moving through the Great Lakes/St. Lawrence Seaway – extending a supply chain from Brazil to North America via the Port of Duluth. The connection was established just prior to the start of the 2013 shipping season when 15,000-plus metric tonnes of kaolin clay was discharged from the Liberia-flag Cornelia at the Duluth Seaway Port Authority’s terminal on Dec. 6, 2012. Not only was it the first shipment into Duluth, Minn., for the IMERYS company, but it also was the Cornelia’s first transit of the Great Lakes-Seaway system. A second shipment of 17,000-plus metric tonnes of kaolin arrived onboard the Yulia (also flying the flag of Liberia) in early June of 2013; and the Cornelia returned in late November with another 15,000 tonnes. Additional shipments are planned for 2014. Kaolin is a hydrated aluminium silicate crystalline mineral used as a ‘bulking agent’ or filler in a variety of industries including ceramics, paper, paint, plastics, rubber, sealant, adhesive and chemicals manufacturing. This particular clay adds gloss/shininess in papermaking and is being mined, refined and shipped by IMERYS. The world’s largest producer of quality kaolin, IMERYS has deposits and production plants in the UK, Australia, US and Brazil. The product arrives in bulk as a powder, which is conveyed indoors to a covered facility on the port terminal for further processing into a slurry for final delivery by tanker truck to customers in the region.